Here is a simple circuit to monitor the voltage level in Solar panels. 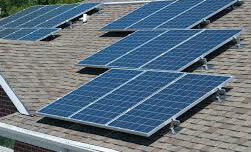 Usually a volt meter test is done during the installation of solar panel and then after, the panel remains unattended. If the solar panel is not providing sufficient voltage for charging the battery, that will permanently destroy it. A 12 volt Solar panel gives maximum of 22 volts DC in bright sunlight, which drops to around 16 volts when the load is connected. So a voltage level around 16 volts is necessary for charging the 12 volt Lead Acid battery. But the voltage output from the solar panel may reduce due to the accumulation of dust on the panel and corrosion of terminal contacts. These remain unnoticed ,so only when the battery fails ,we note this. This simple circuit solves the problem. If the solar panel gives above 15 volts with the battery connected, the LED remains off. When the voltage from solar panel drops below 15 volts, LED turns on to indicate low voltage. This usually happens when the sunlight is low, but if the LED remains on in bright sunlight also, it indicates low output from the solar panel. The circuit can also be used as Battery level monitor. 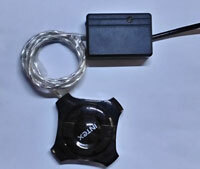 You can use this Solar charger to charge 12 volt Lead Acid or Tubular battery. 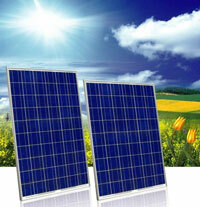 It is voltage controlled and charge the battery when the output from Solar panel exceeds 15 volts in bright sunlight. The open circuit voltage of a 12 volt solar panel is around 20 volts in full light and the 12 volt battery requires around 14-15 volts for charging. 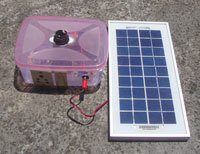 The circuit also prevents the discharge of battery into the solar panel when the sunlight is low.